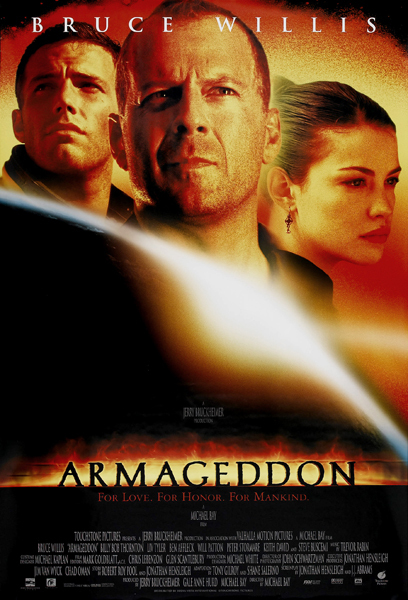 This isn’t everyone’s cup of tea, but if you want a mindless action adventure, you can’t go wrong with this Michael Bay directed and Jerry Bruckheimer produced flick about an asteroid hurtling towards earth and the attempt to stop it. There are plot holes aplenty in this film, every time I watch it, I think to myself ‘wouldn’t it be easier for NASA to train some astronauts to drill a hole rather than teaching hole drillers to be astronauts?’ Bruce Willis attempts to explain that drilling is a science, but I’m pretty sure astronomy might be an actual science. Not a made up by the heroic lead type of science either. Plot holes aside, there is fun to be had here. Harry Stamper (Bruce Willis) and his rag tag group of oil drillers are really charming and funny. Seeing them interact with the stuffy suit wearing stiffs at NASA is one of the films highlights. Willis’s crew includes Ben Affleck as his future son-in-law. Affleck is charming as the reckless AJ who has shacked up with Willis’s daughter Grace (Liv Tyler). Owen Wilson, Steve Buscemi and Michael Clarke Duncan are also part of Harry’s crew. They are all really funny, especially Wilson in one of his earliest roles. I’m sure Sally will be giving this a bad review, but this film is very entertaining. Willis is his usual gruff self. Affleck and the rest of the oil drillers are great fun, and Billy Bob Thornton makes a believable NASA executive trying to ensure this asteroid the size of Texas gets nowhere near Earth. Leave your brain at the door and enjoy the ride. I realized today that my husband must be the biggest Ben Affleck fan on the planet. OK, I’m exaggerating a bit, but he did launch into a rather impassioned pro-Affleck speech after I expressed my dismay that the Boston boy was cast as a Missouri native in the upcoming film adaptation of Gone Girl. Don’t get me wrong, he’s a fine actor and an even better director, but this just feels like Argo casting all over again. Only this time he’s about five years too old for the part (but looks even older). I also hate hate hate Aerosmith’s “I Don’t Want to Miss a Thing.” Worst. Aerosmith. Song. Ever. I remember when Armageddon was released and everyone my age loved this song. It was beyond aggravating to think that Toys in the Attic would be totally wasted on these people.